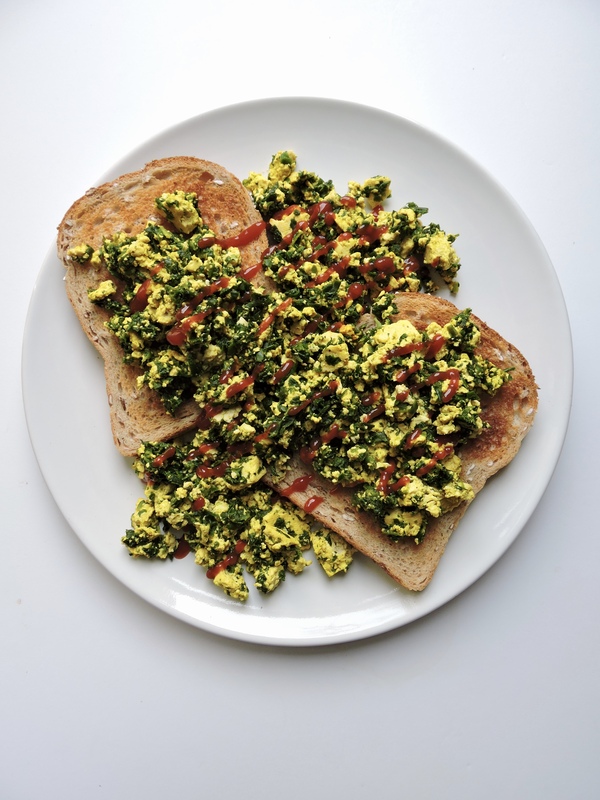 It’s been a while since I’ve shared a recipe with you guys, so I thought today I would share one of my favourite creations with you; tofu scramble. This is a vegan classic and it’s definitely a staple in my diet. It’s perfect for when you’re craving a savoury breakfast, or I often eat it for lunch as well. It takes very little time to prepare and you end up with a filling, nutritious and protein-packed meal. If you’re new to veganism and are craving scrambled eggs, definitely give this a go. The taste of eggs is not really there, but the consistency definitely is. If you’re looking for a more eggy taste try adding black salt, which has a sulphur taste. I personally don’t have any egg craving so I skip out on this ingredient. Adding the turmeric to this recipe is good for two reasons; turmeric is great for you and it also adds a yellow colour, making the tofu look more like egg. I hope you enjoy this recipe! Optional: any extra veggies. I added frozen chopped spinach (1 cup), but you can also add mushrooms, onion, red pepper; anything you’d like! Drain your tofu and remove as much liquid from it as possible. You can do this by pressing it between paper towels. In a bowl, crumble your tofu with your hands. You should get a lot of small chunks. Put your bowl aside. In a frying or non-stick pan, add your oil and any vegetables you want to add. Let them cook for 4 – 5 minutes. Add your tofu to the pan and mix it thoroughly with the vegetables. Add all your spices to the pan, as well as the splash of water. The water will help the spices mix in better with the tofu and vegetables. Let cook for 4 – 5 more minutes, stirring regularly. Serve as it is, or with some toast. Let me know if you guys try this out; I would love to know what you think. And if you have any recipes you’d like to see me share, do let me know in the comments! I share my food regularly on Instagram.